Experienced users that upgraded from Windows XP, Vista, or from other previous versions to Windows 7, Windows 8, Windows 8.1 were surprised to find out that the "Stereo Mix" option was not there anymore. This happened even with the very same computers and hardware that allowed using Stereo Mix in earlier versions of Windows, so technically the device had to be there. But it wasn't. Here we will describe briefly what "Stereo Mix" is and why it is so important for sound recording. By the way, the device can have different names, "Stereo Mix" is simply the most popular one. Among the others you can find "What U Hear", "Wave Mix", etc. The main purpose of the "Stereo Mix" recording device is to record everything you hear in your speakers or headphones (as you see, "What U Hear" is a more telling name). This is very helpful, as such feature allows recording virtually everything: movie sound tracks, internet radio, skype calls, sound from games, and so on. It even allows removing DRM protection from various songs, audio books and other digital audio items purchased online. And probably this was the main reason why the feature was removed in Windows 7. Normally these options are disabled, so you should enable them. After this, new devices will appear in the list. Stereo Mix may be one of them. If still see no Stereo Mix and no other name with a similar meaning, there is still something you can do. Check the exact name of your sound card, visit the official site of the sound card's manufacturer and download the latest driver. Windows, as usual, is pretty clever at recognizing devices and installing drivers automatically, but driver versions that come through Windows Update often have the "Stereo Mix" feature completely disabled. On the other hand, manufacturers offer full-featured drivers on their sites, so using the latest driver from the official site instead of the one that gets installed automatically can fix the problem. Finally, we have to note that some sound cards do not have the "Stereo Mix" capability at all. Typically this refers to built-in sound cards of cheaper notebooks. 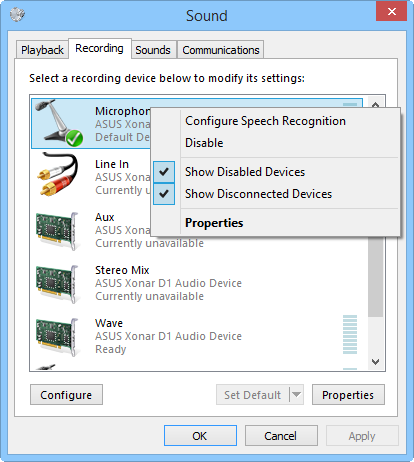 Desktop computers normally have full-featured built-in sound cards. You can use MP3 Recorder Studio to record everything you hear with the help of the "Stereo Mix" (or similar) device.